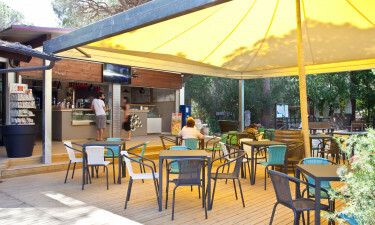 Camping Maremma Sans Souci is situated directly on the Tuscan coast in the middle of a beautiful pine forest. Here you have direct access to the sandy beach, which is ideal for children due to the beautiful bathing water and the fun playground. The site has something for everyone - from archery to bike hire. 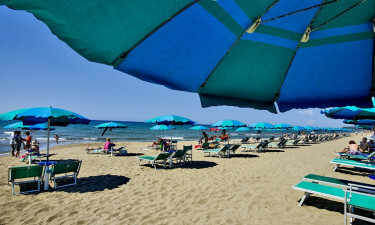 Camping Maremma Sans Souci is a campsite for the whole family. Book your family holidays now with LuxCamp. From the campsite you have direct access to the sandy beach, where fine sand and beautiful blue sea await you. The sandy beach is only accessible to guests of the campsite. On the beach you will also find a beach volleyball court and a play area for the little ones. You can also rent canoes and attend diving courses. At the campsite you can challenge your inner Robin Hood as the site has its own archery range. For the youngest family members there is a fun animation team during the high season offering children's activities such as babydance, sports tournaments and evening entertainment. 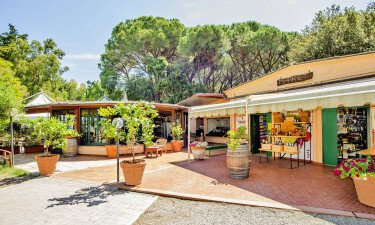 The campsite has a nice restaurant called "Restaurant Mama", where you can enjoy delicious pizzas on the terrace under the Tuscan sun. For these delicious meals, the restaurant serves a selection of tasty Tuscan wines. You can also find the small bar where you can taste delicious drinks. The bar also offers breakfast, lunch and ice cream. In the mini market of the square you can buy bread, fruit and various local specialties as well as local wines.